John Cable’s Grist Mill was one of several grain mills in Cades Cove but it is the only one left standing today. The meal and flour milled provided the primary ingredient for making bread. The two granite millstones are actually the originals, dating back 1868. The original gears inside the mill, what makes the mill and wheels turn, were originally made of wood but have since been restored and are now made up of a mix of iron and apple wood. Beef tallow, a fat used as grease, was used to lubricate the gears and the main shaft. The normal milling rates used to be between 40 or 50 pounds an hour but now only generates around 6 to 10 pounds an hour. The max they could produce is usually around 150 pounds an hour, because the milling stones can get too hot due to friction. This heat can affect the taste and texture of the flour. All of this was powered by a large water wheel which is turned by a creek or river. The mill in Cades Cove, at least the one left standing, was typical of Appalachian communities. Making bread was essential to life in Appalachia, and without any modern grocery stores, they had to make it on their own. Bread was essential part of the everyday diet in Appalachia. It provided some very important calories in smaller amounts than that of corn, or other agriculture products, or even meat. Communities throughout the region were almost always placed near a reliable water source. 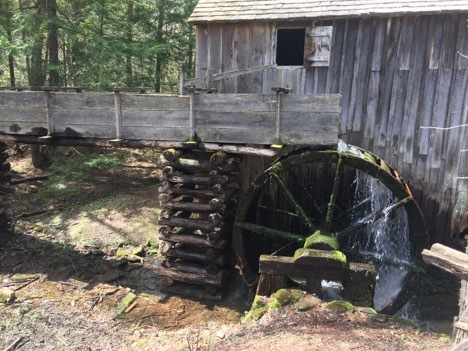 Using that water source, moving water like a river or creek specifically, communities could power wooden or metal machinery like that of the mill in Cades Cove. Powering these mills was essential to provide bread to the community. Sometimes these mills would be operational year round, however often during the coldest months of the year the creek they utilized would dry up, leaving people dependent on either trade or storage to get the bread they needed. Today the mill is right next to the visitor center and some old homes of other Cades Cove residents. These structures didn’t exist when the mill was at its height of production but they do help give an example of what John Cable’s own home might’ve looked like. There are other historic mills throughout Appalachian and the Great Smoky Mountain National Forest that utilize many of the same tools and modes of production. Most of them were built around the same time as John Cable’s Grist Mill. Just going to show that this resourcefulness was not unique to Cades Cove.